Beyond lava, ash and toxic gases, scientists can now add cancer to the list of hazards posed by some volcanoes. Some medical geologists think that fibrous material inside ancient volcanic rock in Turkey has led to almost half of the deaths of residents in two of the regions villages. Researchers previously noted that naturally occurring asbestos fibers, when inhaled into the lungs, could lead to mesothelioma  a rare and often fatal form of cancer that primarily affects the lungs (see Geotimes, September 2005). Research started in the 1970s by Izzettin Baris, a pulmonary physician at Hacettepe University in Ankara, Turkey, showed a similar effect from an asbestos-like fiber called erionite, found inside the rocks from ancient volcanic tuff on the Anatolian plateau in Turkey. Many residents of Tuzköy and other Turkish villages have been exposed to an asbestos-like fiber found in volcanic tuff, once a popular local building material. Researchers now think the fiber can lead to a rare form of lung cancer. Photo is by Philippe Grandjean. 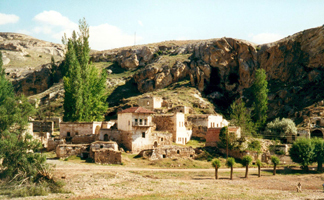 Publishing in the March 15 Journal of the National Cancer Institute, Baris writes that a link exists between a high rate of deaths from mesothelioma and exposure to volcanic rock that some villages in Turkey use for storage and building materials. The fibers in the volcanic material have the same type of adverse health consequences as asbestos, says Philippe Grandjean, a professor in the environmental health department at Harvard University in Cambridge, Mass., and co-author of the study. But exposures in the villages of Karain and Sarihidir caused a mortality that appeared totally out of proportion, he says, to previously known cases of mesothelioma spurred by environmental factors. Starting in 1979 and continuing for 23 years, Baris recorded 661 deaths in Karain and Sarihidir, all of whom lived alongside erionite. The fibers formed after ashes from ancient volcanoes cooled, leaving pockets inside the volcanic tuff where the minerals crystallized. The Turkish landscape no longer resembles its once volcanic landscape, but pockets of erionite still exist within the regions bedrock, quarries and eroded rock walls. Similar minerals are also known to occur in California, Nevada and Oregon, as well as Ireland, Iceland, New Zealand and Japan. In Turkey, the volcanic tuff is easy to cut, lightweight and free for the taking, Grandjean says, so village residents use the material to build houses, as well as to carve out underground storage areas to keep food safe and cool in the summer heat. Brushing and washing walls built from the tuff only adds to residents exposure by releasing erionite fibers into the air. During regular visits to the region, death certificates and other information Baris collected revealed that in the erionite-bearing villages Karain and Sarihidir, 44.5 percent of 661 deaths resulted from mesothelioma. Thats compared to only two cases of mesothelioma documented in the deaths of 230 people from the nearby village Karlik, where there is not any known exposure to erionite. This is one of the highest relative risks ever recorded in cancer epidemiology, Grandjean says. Jonathan Mayer, an epidemiologist at the University of Washington in Seattle, says that he has never heard of an area in the world where the number of deaths from mesothelioma is that high. As far as the percentage of deaths in a given population is concerned, the only situation comparable is AIDS in Botswana, which is right around 50 percent, he says. But the difference, he says, is that cases of mesothelioma from erionite are localized in Turkey and, compared to AIDS, the total number of deaths is relatively small. Following his initial research, Baris communicated his findings to Turkeys minister of health, who has designated the villages as emergency areas. In recent years, the government has helped villagers relocate into new housing built from tuff-free materials, but we dont know if this is going to cure the problem or if the area is simply uninhabitable, Grandjean says. Erionite particles blowing in the wind, he says, might carry unhealthy levels of exposure. Also, geologists have discovered erionite alongside additional Turkish villages, including Tuzköy and Karacaören.